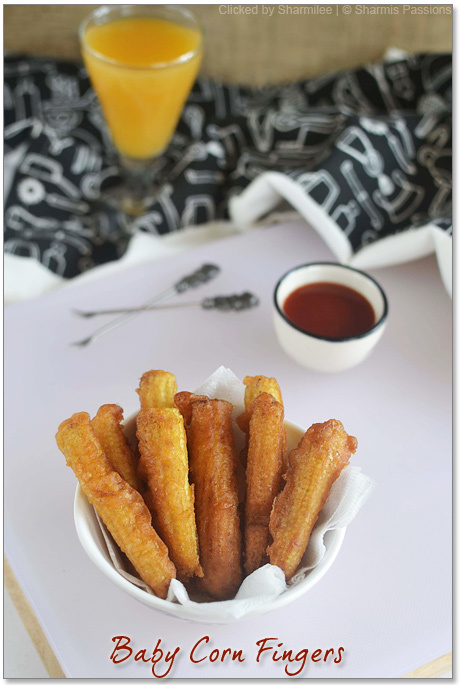 With perfect & neat clicks of all her mouthwatering recipes, Sharmi`s posts never fail to amaze its readers. She has a way with the recipes that makes it easy for all to understand and try out successfully. Her blog features a wide variety of recipes – from starters to desserts to festive specials – with step wise pictures. The recipes usually call for readily available ingredients but the combination is such that the end result is nothing short of exquisite food! Another reason to admire her space – for the immense effort and patience she puts in for each of her posts. Thank you Sharmi for contributing this all-time favorite and popular starter for Prathi Ruchi. Coming to the recipe : Ever since the little one started liking baby corn I am trying new dishes with it. This was one of the tries I made last week – It was a perfect starter and vanished in no time.